The word has come down from Mrs. Thompson, she wants a less expensive cellular plan. She is currently using Straight Talk’s $45 Unlimited Monthly Plan but isn’t use anywhere near the included 5 GB of high speed 4G LTE data. I decided to switch here from Straight Talk to Cricket Wireless. Cricket Wireless has a $30 monthly plan that includes 1GB of fast data. She thinks that is about right for her needs. When I first signed her up for Straight Talk, she made use of the data, mostly watching Netflix and streaming video online. But she doesn’t seem to do that anymore and between work and home she spends the majority of time connected to Wi-Fi. 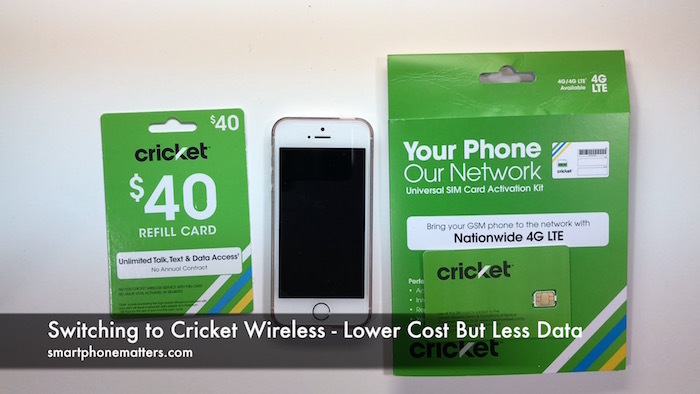 Click here to sign up for cricket wireless and earn a $25 credit. But she still wants to have enough data for when she isn’t connected to Wi-Fi. She likes using Maps and navigation. Wants to be able to send and receive, email, browse the web, and exchange pictures using iMessage. Seems like 1 GB should be enough, so we will try that and see. I’m going to save some money after this switch. I expect to save over $190 a year but switching to a smaller data plan. Her Straight Talk plan cost $46.74 a month when you deduct the auto-refill discount and then add in state sales tax and fees. That’s $560.88 a year. With Cricket, the $30 1GB plan is $30 per month with all taxes and fees included for a total of $360 for the year. So the plan savings come to $200.88. I’m going to subtract the $10 I spent for the SIM activation kit. And because I am activating her phone and plan online I don’t need to pay the $25 in store activation fee. $190 a lot of money to save for a year. Especially since it was being spent on unused data. I’ll be back with more to document and discuss the sign up and transfer soon. Sign up for Cricket Wireless and receive a $25 credit! If you decide to sign up for Cricket Wireless, use the link below both you and I will receive $25 service credit on our accounts. Hey I just signed my sister up with Cricket Wireless using your code… As usual with promo codes it wasn’t all that straight forward because it has you sign up for the rewards first before you start the process to order a phone and transfer your number on the main website. I’m guessing once we get the phone and register it we can link it to the rewards account and then you and she both get credit? Hope she likes this service! I may be switching away from At&t contract plan next! Your videos were helpful. thanks. My wife likes the Cricket plan she is on. I also recommend you check out AT&T prepaid and even Net10’s ATT network as they have new plans that are just as competitive with some of their plans. With respect to to promo code, it does take some time to take effect. At some point after I originally signed up they changed the service they used for the promo codes from a web based system to some other company’s app based system which is more confusing.